As an alternative you might want to check out the Gold's Gym 450 treadmill which offers better quality for just a few bucks more or for more choices, visit our best buy treadmills page. The Weslo Cadence 450 CS treadmill has very little competition when it comes to price. 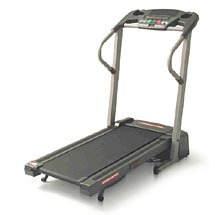 It is the lowest priced treadmill in the market that comes with a power incline feature. Weslo’s 450 CS treadmill is perfect for those on a limited budget. If you’re looking for a treadmill to be used for walking a few times a week, then this model is definitely worth your time. However, its durability and quality is questionable. It is made from cheap materials, which is the reason why it only comes with a short 90 day warranty. So I don't recommend running on it. Just use it to walk or from time to time, jog. The Weslo Cadence 450 CS treadmill comes with a 2.0 HP motor which is quite powerful considering it is a budget treadmill. This motor is strong enough to give you a speed of up to 10mph but due to its lack of quality, I don’t recommend maximizing this motor’s capabilities. As mentioned above, this is the only machine below $300 to offer an incline feature. It has a power incline of 3% to 10% which allows you to have a more intense workout. The Step-by-Step™ Feedback Console lets you easily keep track of your workouts. This 3-window LED console displays your speed, time, pulse, distance covered and calories burned. The EasyPulse™ Heart Rate Sensor enables you to workout in your target heart rate zone. You simply press your thumb to the sensor and it gives you a quick reading of your heart rate. The Weslo Cadence 450 CS treadmill is also built with Comfort Cell™ cushioning. This lessens the risk of joint, ankle and knee injuries by cushioning harmful impacts. The 45"L x 16"W treadbelt comes with non-slip tread to prevent slipping or sliding. Giving you a better grip for a smoother, more comfortable run. The Space Saver® Technology allows you to fold-up the treadmill after use so it doesn’t take up so much space. This feature is perfect for those with limited areas at home. Every problem this treadmill has can be associated to one thing, its lack of quality. But the reason people buy this treadmill is not because of its quality, but its price, and for a price like this, it would be hard to get all the features it boasts. I do admit that it would be hard to find a machine with comparable features for just $300. However, I wouldn’t recommend the Weslo Cadence 450 CS treadmill unless you only have $300 to spare on a treadmill. With its quality issues, this machine is a headache waiting to happen. As far as low priced treadmills are concerned, I believe that there are other entry level treadmills out there that would give you way better value for a little more money. Please visit our best buy treadmills page.